The cause of the fire is not yet known; the authorities have launched an investigation. Many of the victims were inside the cinema halls. Approximately 660 emergency personnel deployed in rescue operations. 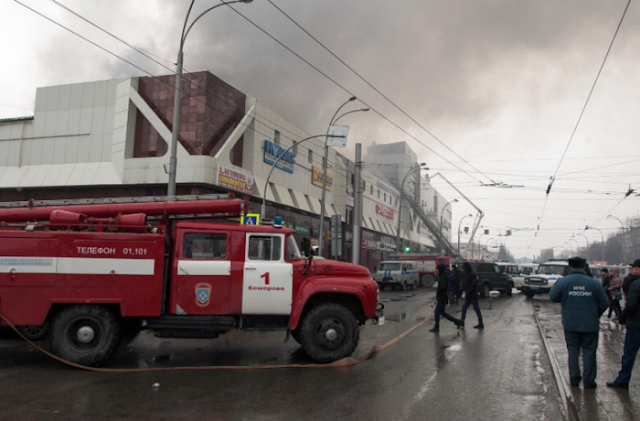 Moscow (AsiaNews / Agencies) - At least 48 people lost their lives in a fire that devastated a commercial complex in the city of Kemerovo, a coal mining center in western Siberia. Authorities declare that 27 are currently missing, while 41 of the victims could be children. The cause of the fire is not yet known, but the authorities have launched an investigation. Local media report that the flames broke out around 5.00 pm yesterday on one of the upper floors of the building, intended for entertainment, and many of the victims were inside the cinema halls. Approximately 660 emergency personnel were deployed in rescue operations. "According to preliminary information, the roof collapsed in two cinemas," says the Russian Investigative Committee in a statement. The Russian officials initially announced the figure of 64 missing persons, to then clarify that the number included victims whose remains had not yet been identified. At least nine of the bodies recovered are children.